As construction vehicles are setting up in their neighborhood, residents of the Central Bayshore South (CBS) neighborhood are making a last ditch effort to convince the City to cut back on plans to elevate their roads. In a petition to City Commissioners and the City Manager, residents say they “don’t have the same tidal/flooding problems that plague the City’s ‘coastal’ streets” and, therefore, roads in their neighborhood should not be raised to the same elevation. “We recognize the need for a gradual lifting of our street elevations, but it is indisputable that raising our streets to 3.70’ will wreak havoc to our existing trees, create costly and perhaps unmanageable drainage problems in our private properties, increase costs and problems associated with ‘harmonization’, while potentially inflating our property insurance costs and lowering our property values.” Harmonization refers to the City’s efforts to create a gradual incline from the elevated streets to driveways. Lower the CBS’s maximum street elevation to 2.70’ NAVD. No net widening of any streets, inclusive of valley gutters, if required. If valley gutters are required, then they should be incorporated into the existing street width. All Bike Lane and Traffic Calming device locations (roundabouts, tables, etc.) in the Central Bayshore Neighborhood shall be subject to BHOA review and comment. City Engineer Bruce Mowry says there are a total of 238 homes in Central Bayshore. "Of those addresses, the information indicates that 17 homes may have finished floors below 3.7’ NAVD or 7% of the total addresses," according to Mowry. "We believe that 5 homes (2% of the total addresses) may have finished floors below 3.2’ NAVD and two homes have floor elevation of approximately 2.7’ NAVD." Given the impact of sea level rise, Mowry says eventually residents will have to adapt their homes to meet changing conditions. In the meantime, he says "The City’s improvements to the neighborhood will take into account all homes and make adjustments in the project to design a system to minimize the potential of flooding of these lower homes until the owners can either raise or replace these low elevation homes." What happened with our Original Project’s funding, paid for by our ad valorem taxes, and approved in the public process? These funds were supposed to be in a “lock-box”. Why hasn’t our neighborhood been given the same opportunity to review and comment on the City’s design (at public meetings, DRB, City Commission, etc. ), as in every other City neighborhood? What is the difference in price between the CBS’s Original Project and New Project? No word on number of signatures gathered or when it will be presented to the City. 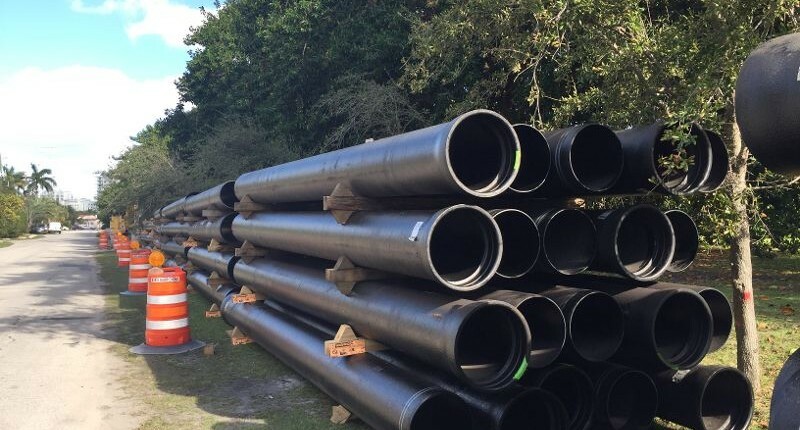 In the meantime, the contractor on the project began mobilizing construction equipment and staging materials this week along Prairie Avenue near Miami Beach High School. The installation of a new water main along Prairie Avenue from Dade Boulevard to 34th Street is scheduled to begin next week. Further details are available on the City’s Planned Progress website.